When we first sat down to interview Boss Charles he greeted our friends, Char and George, with a big friendly hug! His personality towards us, a couple of strangers, was one that wanted to express deep professionalism, but it was clear his personality was fun loving to say the least. His knowledge of English is somewhat limited so our friend and head of translators at HCM, Gilbert, helped us out when we sat down for an interview. He described his title at HCM as “Woodshop Director,” but once we got to know him better and stepped into his wood working shop it was clear he was so much more than just a director. Like most Haitians when asked how his family was he quickly responded, “good good!” Once we discovered I was around the same age as some of his children, we saw the side of a proud father that takes pride in working hard for his family. Boss Charles also takes pride in the life he now has and the work he does. When asked the question what your day to day operation looks like, the answer he gave us speaks to his character. “To teach students for Haiti tomorrow, preparing them for the future.” He said that the opportunity of sponsorship through HCM changed his life and gave him the opportunity to become a professional. He wants others to have that same opportunity. “I had nothing to do but, they gave me a job.” When asked if he works with kids who have similar stories to his he said, “Oh yes! And I want to give these kids what HCM has given to me”. Most of his students are young men between the ages of 18 and 25. 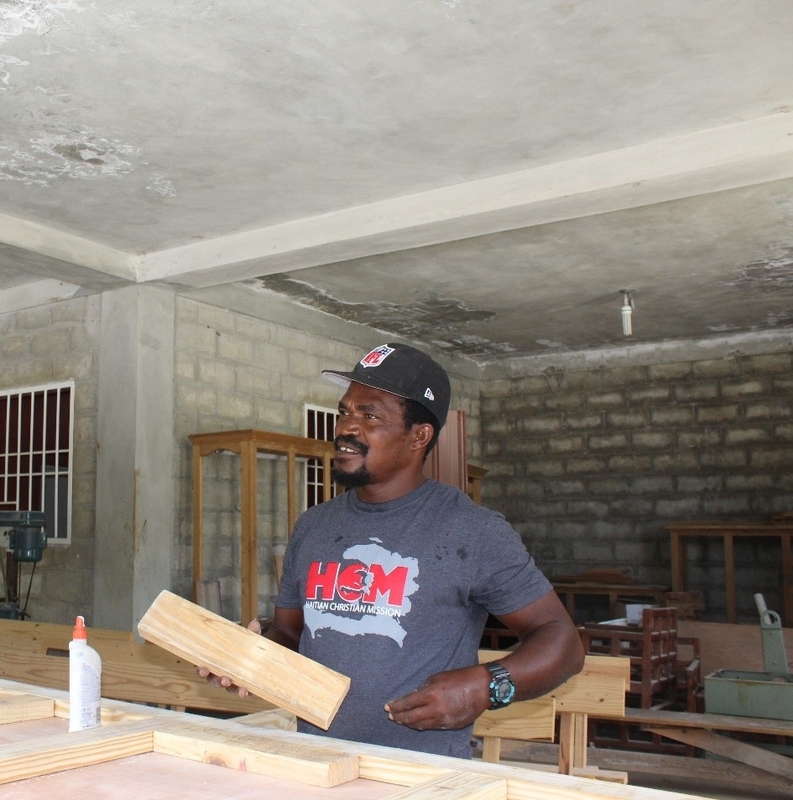 Jobs are hard to come by in Haiti so having the opportunity to train in woodworking will give these young men marketable skills that will hopefully come in handy when searching for a job. Discipleship wasn’t a term Boss Charles threw around but rather everything he described. Discipleship doesn’t have to look a certain way, but it does need to happen. Boss Charles helps develop skills in young men that instill leadership skills, hardworking character and a sustainable craft. Thank you Boss Charles for being a Disciple of Christ and teaching students for a sustainable Haiti.